EDEA NOENE Anti-Shock Technology UnderSoles – Skates U.S. The competition among competitive Skaters is becoming tougher with more and harder jumps and jump combinations being trained earlier and for a longer period of time through the skating career. This training to compete at a higher level, earlier has become much more intense. This level of training intensity can lead to additional stress in the head, neck, back, hips, knees, ankles, and heels due to the repeated impact of the landings. 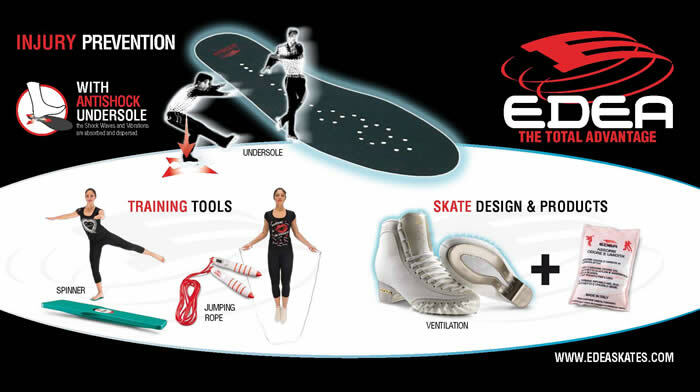 EDEA through SkatesUS.com, is now providing a magical solution that actually absorbs, diffuses, and disperses 94% of the shock and impact vibrations of landing jumps from injuring key parts of the body. NOENE Shock Technology , a Swiss technology is being employed by EDEA to absorb, diffuse, disperse and effectively stop up to 94% of the SHOCK and IMPACT VIBRATIONS from the heel to the head. Skating surfaces (both ice and roller) are hard surfaces that absorb very little if any of the shock of the impact from landing jumps. In fact these shock and impact vibration waves are actually reflected back into the Skaters body to diffuse and absorb them. These waves of energy caused by the collision shock of landing are called kinetic energy or also negative energy. This negative energy can cause long-lasting issues to the nerves that control the free movement of the body. These micro-trauma can show up as pinched nerves, tendinitis, osteitis, and micro fractures to name a few, which can lead to the soreness of the feet, heel spurs, ankles, shin splints, and joint damage and provoke fatigue from the foot through the knees, hips, back, and right up to the base of the skull. 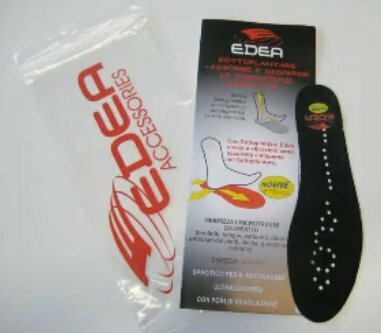 EDEA “NOENE” Shock Technology UnderSoles are a Class 1 Medical device, only an extra thin 1mm thick and ultra-light 13 grams of weight (in size 280, approx a men’s size 9), and are to be installed under the EDEA Anatomic InnerSole or custom orthotic innersoles. They can be easily hand washed with soap and lukewarm water and a sponge. The guarantee is 1 year. Even this very thin EDEA UnderSole will provide the shock absorption qualities for which “NOENE” is famous. The Skater’s instrument is worth gold, take care of it.